Sociology students at Meredith are acquiring some exciting new skills in video production, thanks to a visual sociology course in which students develop short documentary films as their final class projects. Not surprisingly, the students love it. And Assistant Professor of Sociology Kris Macomber sees great value in teaching her students to create documentaries on topics of their own choosing. Joy Deitrich, ’21, has taken two classes that included a documentary project. She sees value in filmmaking because of the powerful impact the documentaries have on viewers. Macomber notes that while this component of the course is relatively new, it’s familiar to those working in the field of sociology. According to the course syllabus, students learn how to use visual methods to capture and interpret sociological phenomena, and explore the impact that visual images and representations have on individuals, groups, and society. This year, Macombers’ students are focusing on a woman or group of women who embody the “Women Warriors” theme that is woven throughout the School of Arts and Humanities for 2018-19. The class was developed in partnership with Instructional Design Specialist Paul Keys. Before coming to Meredith, Keys worked in television and video production for 20 years, shooting college football and basketball games for ESPN, developing short advocacy videos for non-profits and corporations, and producing a documentary on Jesse Helms for UNC-TV. Keys provides video production training for students through a lab model. In previous semesters, video training was conducted as part of the sociology class several times a semester. The new lab model, which functions much like labs that are an essential component of many science courses, was proposed by students who wanted more instruction and more dedicated time to work on their film projects. Keys focuses on core video production skills including story development, shooting, and editing. One of the biggest challenges for students is focusing on the story they want to tell. He enhances students’ learning experience by drawing on his own contacts in the video industry. For instance, he recently brought a camera operator to class to talk about capturing b-roll, or supplemental footage. Students use WeVideo, a cloud-based platform, to edit their projects. Keys likes the collaborative nature and the flexibility of this video editing tool. According to Keys, the course design is now a model for faculty workshops being used by Optimize Learning, a national faculty development firm. But the real stamp of approval, for Keys, comes from the students themselves. “I just like how much they like it. It’s very participatory and experiential, and encourages them to interact with people, on and off campus,” said Keys. This is the third year Meredith has offered sociology courses with a documentary film component. Macomber said while the course specifics continue to evolve, the value of teaching students to make thoughtful video content is evident. In fact, Macomber and her colleague Amie Hess, associate professor of sociology and department head of sociology and criminology, have submitted a paper about the course to the journal Gender and Education titled "My Parents Never Read my Papers, But They Watched My Film: Documentary Filmmaking as Feminist Pedagogy." 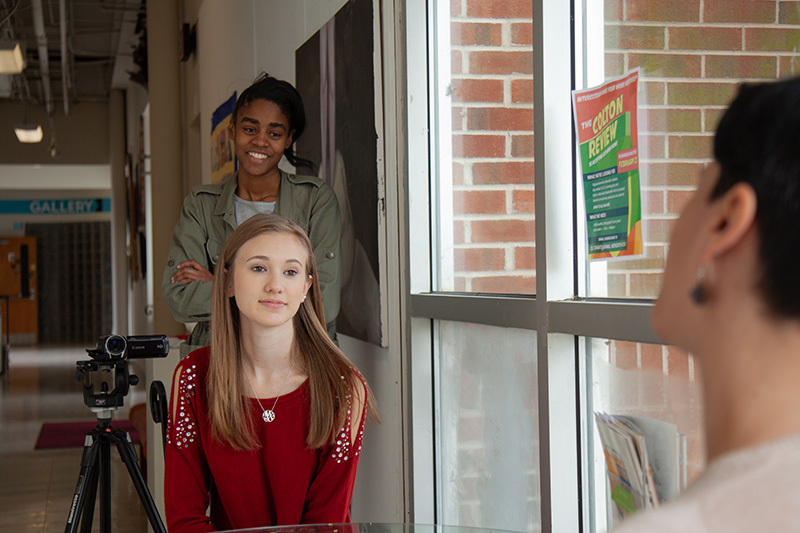 And Macomber, who has long had an interest in digital storytelling, is making her own documentary short about one of her students, Martelle Neely, ’19, who came to Meredith as a Wings student. “She is a woman warrior in her 60s who came back to college after many years of living a full life, and now will graduate in May as a sociology major,” said Macomber. Deitrich has worked on documentaries for two classes and can speak firsthand about the value of the experience. This year, she and her project partner Tessa Minnich attended the Women's March in Raleigh and interviewed attendees. “Our documentary focuses on women who continue to support the March and push for policies that pertain to women’s rights,” said Deitrich. Deitrich also created a documentary last year for a sociology class, but said she did not have the confidence to interview people she did not know. Instead she chose to interview her lacrosse team because it was more comfortable. This year, she chose a topic that would force her to discover new people and new experiences. A number of student documentaries were shown at the Meredith College Documentary Film Festival in January. Films by the class featured in this story will be shown on April 17 at 2 p.m. in Kresge, during Sociology Week.